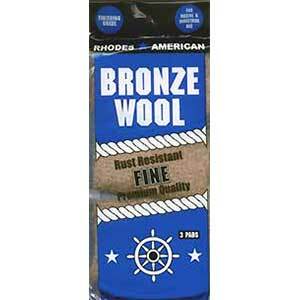 Copper wool offers limited corrosion resistance over plain carbon steel wool. 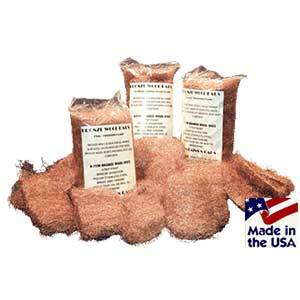 Lustersheen 5 LB Copper wool is made from >99.9% pure copper and available in Grades Coarse, Medium and Fine. 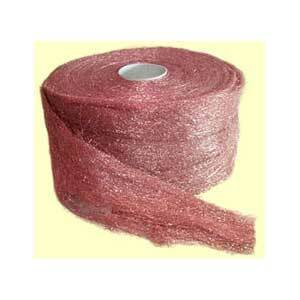 A 4″ wide continuous ribbon, between 1/4″-1/2″ thick in an uncompressed state. 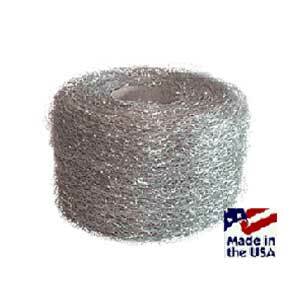 Fine is 50 microns wire, Medium is 80 microns wire, Coarse is 100 micron wire. 5 pounds net weight. These are sold by weight at 5 lbs. Thickness of the web can vary significantly, and this will have an effect on the total length of the web such that it can range widely. Usually around 60 feet, but can range in length from 40 feet to 75 feet.